York St John graduate Adam Foster, who played Guildenstern in the recent Sheffield Crucible production of Hamlet, directed by Paul Miller, returned to his old university (where I teach) to speak to our Study of Shakespeare students on 28th October 2010. And what a delightful young man he is, and how unexpectedly excited he was to be taken for lunch in our canteen! ‘One of my best friends lived in that room just there,’ he said, pointing out the window at the halls of residence opposite. Because the Sheffield Crucible production had sold out early on (over 30,000 people had seen it in 5 weeks), many of us had not been able to get tickets. However, Adam Foster talked about the process of preparing for his part in a way that engaged all of his audience. His confession that he had been ‘phobic of Shakespeare’ before he started acting immediately put everyone at ease. Part of this process of taking ownership of the work included the pre-rehearsal roundtable readings of the play (which was an amalgamation of the Folio and the Second Quarto). The cast and production team did two critical things during this initial period. The first was to discuss which parts were to be cut out, so that although ‘a production is an organic thing, constantly changing’ (Foster 28/10/10), any major changes were agreed from the outset and belonged to a coherent vision. Thus, the line ‘Rosencrantz and Guildenstern are dead’ was taken out. ‘This was the director’s choice: he felt that by the end of the play there were enough dead bodies,’ Foster explained, ‘but because we were included in the decision-making we didn’t feel that we were having our parts reduced.’ This wasn’t quite the case for all the cast. Apparently, there was a real struggle at times between Miller and Barbara Flynn over whether or not Gertrude would have been present at key scenes, with Miller arguing that as a female consort she would not have been, and Flynn arguing that as Gertrude she would have been. However, some of the reviewers considered that both Gertrude and Ophelia had been underused, so perhaps Flynn’s position was ultimately justified, especially as the mise-en-scene was non-specific – ‘vaguely Chekhov’ according to my colleague, Gweno Williams. The second way in which the read-through enabled the actors to engage with the text as ‘living words’ was when, Foster said, ‘we were told to “put what you’re saying into your own words”‘. This helped them a) to understand what they were actually saying through all that blank verse and b) overcome any lingering Bard-phobias, perhaps. Talking of the idea that a production is organic, my other colleague, Julie Raby, talked about how the production continued to change throughout the performance (you can read her detailed discussion of this through the blog link below). She felt that it had engaged with feedback from critics and audience responses and quoted Michael Boyd of the RSC in seeing ‘the production [as] a rehearsal’. ‘Polonius, played by Hugh Ross, never said the comical-tragical-historical-pastoral bit in the same order two nights running’ said Foster, and Rosencrantz, who sounds a bit more of a method actor than his partner, invented different back-stories for every night of the performance. ‘I never knew where he was in his head! One night he told me off-stage that I had just dragged him from an opium den… He had decided that Rosencrantz was a bit of a party animal, and we joked that he just said that because he was a party animal himself, and he was making excuses for his acting!’ This sense of an canonical text becoming something dynamic, unpredictable, and even a little dangerous in performance was a revelation for some. This discussion reminded me of two very important points: that performance runs are not static, unchangeable, single entities, and that it is all the bit parts around Hamlet that add depth and texture to the play. These songs were performed in the original Italian and Latin with English translations provided in the programme. These were interspersed (or perhaps juxtaposed or ‘contained’ would be better words?) with the prose of male commentators, enacted by Hugh speaking in English. Hugh, playing a variety of Italians and Patriarchs, nonetheless had a touch of the ‘English Puritan’ in him, indicated by his Malvolio yellow tights. Come to think of it, I’m not entirely sure that Hugh was wearing yellow tights – it just seemed as if he should be! This combination of forms and of language led me to think about performance conventions and interculturalism. As an English audience, we listen without question to songs performed in their original language, but if Hugh had then spoken in Latin, even if the English translation was provided in the programme, the audience would have gone into a state of panic and bemusement. ‘Why isn’t it translated?’ we would have demanded. ‘Why are we being asked to listen to something in a language we can’t understand?’ After all, we weren’t in an intercultural performance space – or are we? What makes a performance intercultural? Why don’t we think of Italian music/English spoken word as intercultural in the same way that we would think of mixed language spoken drama as intercultural? From Pavis (1996) The Intercultural Performance Reader London and New York: Routledge. But back to Wilson turning Japanese! Weiler concludes, however, that the appropriation of Japanese theatre elements in Wilson’s work aren’t necessarily about Japan/ese, but are rather ‘symbols of the “foreign” in general’ (p.112). They represent ‘alienation’ and ‘incommensurability’, and in this, Weiler argues (or, at least, I think Weiler argues), the audience finds the attraction, ‘the beauty in the “foreign” which fascinates us’ (p. 113). This, I suppose, links to what Alex Huang notes as the Westerners fascination with the visual ‘exoticism’ of Asian theatres. Robert Wilson, in his Der Spiegel interview, sheds further light on why Japanese theatre in particular helped him develop his vision. ‘ Theatre should not interpret, but should provide us with the possibility of contemplating a piece of work and reflecting on it. If you behave as if you’ve grasped everything, then the work is finished […] I always tell my actors, “It’s not our job to provide answers, but to raise questions. We must ask the questions so that the text opens itself to us, and by doing that we enter into dialogue with the audience”‘ (p. 101). Interestingly for me, his example is, of course, Hamlet. ‘The text is just the surface, in some ways the skin and there is flesh underneath it and underneath that the bones. One single word, let’s say “Hamlet”, or even in one single letter of that, “H” can contain everything a man has ever felt, experienced or suffered. It’s very complex‘ (p.103, my emphasis). I’ve singled out this sentence because of its possible relevance to the recent Gdansk production, H.
Fischer-Lichte explores alterity, or Otherness, in theatre through a European lens – from Goethe to Brook and Mnouchkine. She notes the worldwide phenomena of ‘interculturalism’ in theatre being recognised/named in the 1970s but points out that it had been going on for generations. In the 18 and 19C, Goethe thought that world literature would replace national literature (p28). Nonetheless, he revised Romeo and Juliet to suit the tastes of his German audience. He also read an Indian drama, the Sakantala, claiming that it influenced not only his work, but his ‘whole life’ (p29); however, he ultimately concluded ‘that our sensibilities, customs and ways of thinking have developed so differently from those in this eastern nation that even an important work such as this… can have little success here [in Weimar]’ (cited p29). Thus, it was the European avant-garde movement which first began to actively engage with the ‘foreign’: ‘By calling for the re-theatricalization of theatre which they felt was long overdue, they rejected the form of bourgeois theatre of illusion so dominated by language, and turned to theatre traditions from completely foreign, non-European cultures to encourage and advance European theatre’ (p30) e.g. Gordon Craig’s use of African masks, Reinhardt’s hanamichi flower path through the audience, Brecht’s Verfremdungseffekt from Chinese opera. This was all ‘a conscious and productive encounter’ with foreign traditions (p30). Most of Pavis/Fischer-Lichte’s readers are probably already familiar with much of this. What Fischer-Lichte introduces as new information (at the time of publication) is what she calls the ‘remarkable fact’ that, just as the West was appropriating the East, so was the east appropriating the West. In 1885 The Merchant of Venice was put on Kabuki-style; this lead to a fully Westernised production of Hamlet in 1911. This ‘new drama’ or Shingeki was fully established by the 1920s, often staged by the ‘Literary Society’ or Osanai Kaoru’s ‘Tsukiji Little Theatre’ (1924), drawing particularly on Chechov, Ibsen and Stanislavski. In a reversal of the vision of the European avant-garde, ‘The members of the Shingeki movement believed that traditional theatre forms such as Noh and Kabuki were outdated and sterile. They felt such forms were no longer in touch with the problems of contemporary Japanese society. By turning to realistic drama of european origin, they tried to stimulate the development of modern Japanese society by offering a model’ (p30-31). Fischer-Lichte goes on to explore three case-studies, not all of which have direct relevance for my work. However, there are a couple of points that she makes about intercultural theatre in general and Japanese theatre in particular that I would like to draw out. Again, as the ‘new’ intercultural avant-garde (Brook, Wilson, Mnouchkine) took off in the West, the ‘Little Theatre tradition’ was re-established in Japan, but not in the form of Shingeki which, post WWII, was ‘now considered to be the symbol of a thorough Westernization of Japanese society’ (p33). Contemporary Little Theatre practitioners, such as Suzuki Tadashi, interpret ‘Western play texts with a performance style which clearly draws on the performance techniques’ of traditional Japanese drama (p33). This, I assume, is the influence which lies behind Ryutopia’s Shakespeare productions. Suzuki combines what he sees are the strengths of two traditions, Western linguistic expression and Eastern physical expression, to make a new theatre language (p34). Fischer-Lichte gives an example of Suzuki’s use of Japanese tradition: the Suri-ashi or sliding step and the Ashi-byoshi or stamping step. Suri-ashi makes the walker appear rooted to the ground, as with Lady Macbeth in Throne of Blood. Stamping simultaneously suppresses evil spirits and ‘activates the energy of the good spirits living under the stage’ into the actor’s body (p34). Out of context of traditional drama, however, directors can free these actions of their traditional connotations, and give them new meaning. 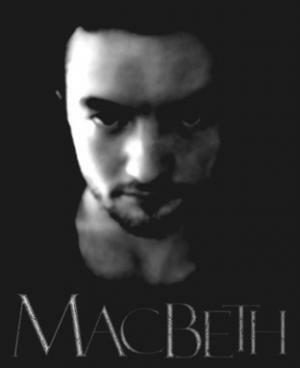 So okay, it’s stretching it a bit to include Belt-Up’s Macbeth in a blog supposedly dedicated to Hamlet’s Chinese appropriations! Polski Theatre and Ryutopia Noh were at least performing my titular play; Mokwha Repertory’s Romeo and Juliet was intercultural – and Korea is next door to China. Belt-Up, by contrast, are local rather than global in the sense of VERY local: resident theatre company at the Theatre Royal, York, with their student-day roots at the University of York. But their production was avant-garde and considerably more entertaining than another article on intercultural theory, so I shall include it anyway. I had originally been planning to go to see this with my 14 year-old daughter, but she got a free ticket through her school for the night before on condition that she wrote a review of it. ‘It was well weird,’ she said when she got back. ‘Good weird or bad weird?’ I asked. Hopefully, the poor lady made a good recovery. The mise-en-scene was a little obscure, a messy dressing-room perhaps, with the brick wall of the theatre exposed at the back. Three Beckett-like clowns rolled around in a slightly stiff British way. Machine guns rattled off stage. It wasn’t until I read the review in the Evening Press that I realised that the set was meant to be a bombed-out theatre from the First World War. Perhaps that is because my house usually looks like a bomb has hit it… But in retrospect it brought to mind Prevért’s poem about the devastated shell of a family home, with tattered lampshades and ‘un omelette abandonné’. There wasn’t an omelette of course, but there was a prominent dining table which, in addition to eating off, was used for sleeping on, hiding under and murderous execution. The bloodied tablecloth subsequently doubled for Macbeth’s courtly robes and Lady Macbeth’s dead baby. According to the Press, the overall allusion of the props and set was to the First World War. Even in retrospect, however, I’m not entirely convinced that the intended message came across. “Like Macbeth is an everyman, so everyone was an everyman in the First World War because they were all conscripted,” said Dominic J Allen of his role. What? Everyman? Conscription?! I thought it was about a deranged Scots overreacher and his wife murdering their way through the Scottish hierarchy in order to fulfil the prophecy of three hags in a wood… Was I watching a different play? The cast of four was very effective, however, with the trampy vaudeville clown/witches taking on all the roles other than Macbeth. James Wilkes’ stubbly, cross-dressed Lady Macbeth, in size 12 stilettoes, ranged brilliantly from hilarious bad-drag to very real tragedy. It was a part written for a man anyway. Then there was a fantastically grotesque scene in the woods, when the tramps/witches performed a magic show. Lady M acted as the magician’s assistant, but instead of chopping him/her in half, one of the other witches pulled reems of knotted together red scarves from between his/her legs, like handkerchiefs from a top hat. Lady M had miscarried. As for the slow strangulation of Wilkes’ Pythonesque Lady Macduff, it silenced all but the most nervous of titters with its gruesome humour.